FRASER® is always looking for ways to improve access to the rich primary source documents and data that are our mission to collect and digitize. Recently, we’ve implemented a new searching and indexing tool that provides a number of immediate improvements to our search results. Among the benefits are better overall control of relevancy ranking, improved performance and reliability, and new and more-advanced search methods. Phrase matching: To search for a complete phrase, enclose the phrase in double quotes to return only documents that match the entire phrase. For example, search for “average hourly earnings” or the “Emergency Economic Stabilization Act” to find results matching only those complete phrases. Wildcard matching: To search for part of a word, rather than the complete term, you can use an asterisk as a wildcard operator. For example, searching for pro* would return items with the words proposal, protection, procedures, etc. Fuzzy matching: To search for words that are similar to another word, you can use the tilde followed by a number that indicates the number of characters that can differ. 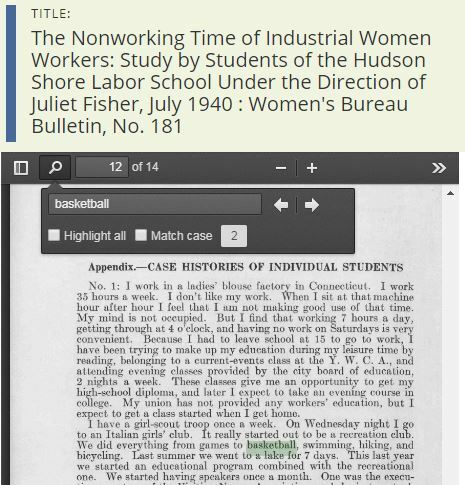 For example, search for labor~1 to return results for both labor and labour. We know that sometimes it can be difficult to find what you’re looking for when searching over half a million FRASER records. That’s why we’re constantly working to improve the search experience for our users. However, great search starts with great metadata—which is why we take great care in describing FRASER materials in the first place. Our FRASER staff follow cataloging standards and library best practices when applying descriptive information such as title, author, and date to FRASER records. FRASER also takes searching to the next level. 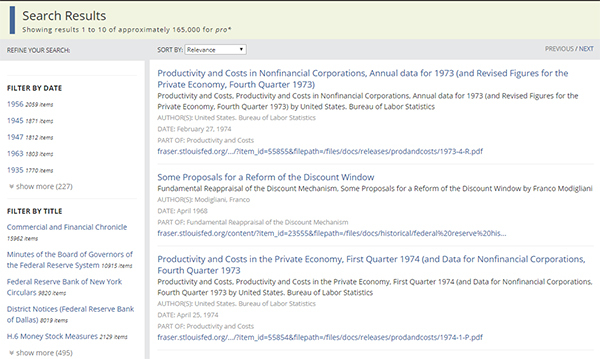 Once FRASER search has brought you to the right document, you can use the search box built into the page viewer to skip right to your keyword (no matter how unexpected your search term might be for an economic history collection). Give the new search experience a try, and let us know if you have any comments or suggestions. We’d love to hear from you!